I wanted a deep, soulful love that lives in my heart and I cannot live without. Got that. I wanted to continue to learn more about the things I care about and feed my spirit. I do that. Regularly. I knew that I had gifts and talents that weren’t being used in the area of service and teaching to others. So, I changed how I thought about my contribution in this world and how I earn a living. I wanted deep, meaningful relationships with other women that inspire and challenge me. I am blessed that I am able to check that box regularly with my circle of sisters that surround me with love and support. 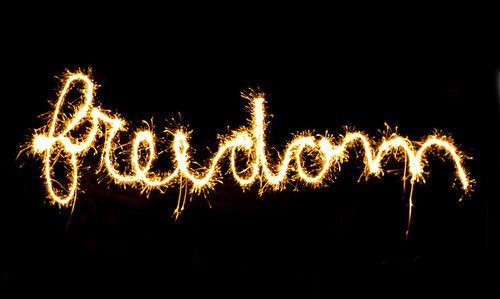 It seems a fitting time of year to delve deeper into how living in freedom is a glorious place from which to create and sustain an abundant life. Freedom from the belief that we’re somehow not enough; not smart enough, not thin enough, not attractive enough, not rich enough, not outgoing enough, not whatever enough. Freedom from uninspiring careers that might pay the bills but don’t feed the soul. Freedom from filling the emptiness in our lives with more material things instead of more joyful experiences. Freedom from mediocre marriages, false friendships and family drama. 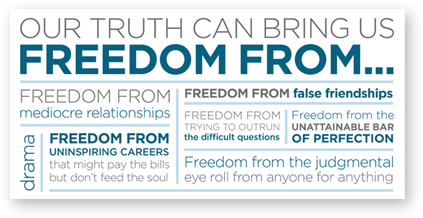 If you also love the idea of living your life from a place of choice, abundance and freedom, I’ve included the Freedom From… Manifesto poster for you to share, download and print. 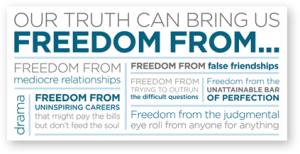 https://www.sharonpopetruth.com/downloads/manifesto/SharonPopeTruth_Freedom_From_Manifesto.pdf It’s my gift to you – enjoy it, print it off, save it and share it with everyone you love.